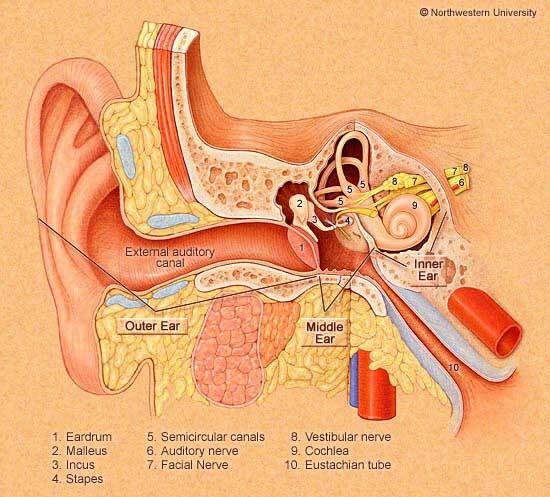 Otitis externa (OE) is an infection of external auditory canal. It is a dermatitis, not all that different from infections in other bodily orifices that don't get much fresh air or sun. Ear wax can provide a culture medium for bacteria. Cleaning of the ear canal can also sometimes be associated with scrapes that allow bacteria an opportunity to grow. Persons with otitis externa present with pain, drainage and loss of hearing. Fungi (otomycosis) are usually accompanying organisms, but can also be the primary cause of otitis media or otitis externa. Mites (demodex) are found in roughly 6% of normal human ears and are more common in ears where a local steroid preparation has been used. (Cevlik et al, 2014). Ear mite infection is occasionally are associated with extremely itchy external otitis (Klem et al, 2009). This should not come as a surprise to pet owners who are familiar with ear mites. Cultures of draining ears are recommended at the initial visit. However, the impact on management is uncertain. The Cochrane metanalysis paper (2010) for acute otitis externa, stated that "Topical treatments alone, as distinct from systemic ones, are effective for uncomplicated acute otitis externa. In most cases the choice of topical intervention does not appear to influence the therapeutic outcome significantly." This was with the caveat that they were not sure if steroid-only drops were effective. Following are a list of potential treatments, both for acute OE and more chronic OE. Meticulous cleaning using a microscope. This may require several visits. Presently most patients are started on a drop that contains a floroquinolone (e.g. ofloxacin), possibly with the addition of a steroid to reduce swelling (e.g. cipro HC). As of 2018, the FDA recently approved ciprofloxacin otic suspension (Otiprio), as a single dose treatment. This is probably the most convenient method. Note that recent reports have suggested that cipro-dexamethasone and ofloxacin-dexamethasone delays healing of the ear drum in rats (Dirain et al, 2018). The combination of quinolones such as ofloxacin and ciprofloxacin with steroids seems to be especially potent at retarding healing. Logic would suggest that a drop without a steroid, such as ofloxacin by itself, would be safer. The "Otiprio" drop mentioned above has no steroids. An antibiotic pack may be used, using a 1/4" gauze (in an adult). This is not common. If ear drops fail, then systemic antibiotics follow. Systemic antibiotics are not recommended as the first line of treatment (Hamerlynck et al., 2006). Because of the bacteriology of OE (staph, pseudomonas, MRSA, fungus, mites), somewhat unusual systemic antibiotics may be used. This may include high-dose trimethoprim sulfa (for MRSA). Acidification (2% acetic acid with hydrocortisone) -- Vosol is a brand name for this preparation. The usual dose is 3-4 drops in the affected ear three times/day. Not used in persons with perforation. See the comments below concerning cost. When acidification fails, antifungal topical preparations are also commonly used. There are numerous of these agents used in animal medicine. None of these is presently FDA approved for human use and for this reason they are used "off-label" in humans. Several of these are available over-the-counter such as clotrimazole -- (Lotrimin AF) cream and tinactin solution. Use of these preparations should be under the supervision of a physician experienced in treating ear infections. Romsaithong et al (2016) reported that 1% clotrimazole solution was more effective than 3% boric acid in 70% alcohol. "Data were collected from 108 pharmacies. The mean prices are noted for each of the individual drugs: Cortisporin (brand) 10 mL, $82.70; neomycin, polymyxin B sulfates, and hydrocortisone (Cortisporin-generic) 10 mL, $34.70; ofloxacin (generic) 10 mL, $99.95; sulfacetamide (generic) 15 mL, $40.18; Ciprodex (brand) 7.5 mL, $194.44 (or $218.60 according to the medical letter); Cipro HC (brand) 10 mL, $233.32 (or $298.00 according to the Medical letter; Vosol (brand) 15 mL, $120.75; acetic acid (Vosol-generic) 10 mL, $116.55; VosolHC (brand) 10 mL, $204.14; acetic acid/aluminum acetate (Domeboro-generic) 60 mL, $22.91; and Tobradex (brand) 5 mL, $166.47." Additionally, According to the Medical Letter, Otiprio (1 ml single dose) costs $283.20. This is roughly 4 times as much as generic ofloxacin 0.3% drops. As can be seen, the least expensive treatment, on average, is Domeboro-generic ($22.91). This is actually an antiseptic treatment, with the mechanism being making the ear canal more acidic. The safest in regards to lowered risk of hearing loss should there be a perforation, as well as the least painful treatment (in our opinion) is moderately expensive (ofloxacin generic -- $99.95, which are $70.30 according to the Medical letter). One wonders why a generic is so expensive in the US. Amazingly enough, drops made of acetic acid (e.g. Vosol-generic) cost $116.55. Considering the cost of the raw ingredients (i.e. vinegar and water), this seems high. In our opinion, the generic ofloxacin 0.3% drops are presently the best choice for acute otitis externa considering price, safety and effectiveness. Treatment of fungal external otitis. Only a few cases have been reported of ear mites in humans. One paper reported treatment with topical hexachlorocyclohexane (Klemm et al, 2009). They suggested that a more contemporary treatment might be permethrin. These drugs are rarely used in humans and their effect is not well understood. de la Paz Cota BR and 6 others.. Efficacy and safety of eberconazole 1% otic solution compared to clotrimazole 1% solution in patients with otomycosis. .Am J Otolaryngol. 2018 May - Jun;39(3):307-312. doi: 10.1016/j.amjoto.2018.03.017. Epub 2018 Mar 6. Hamerlynck, J. V., P. P. van Benthem, et al. (2006). "[From the Cochrane Library: topical antibiotic treatment is more effective than systemic antibiotic treatment for chronic otitis media with eardrum perforation and purulent discharge]." Ned Tijdschr Geneeskd 150(37): 2033-5. Kaushik, V., et al. (2010). "Interventions for acute otitis externa." Cochrane Database Syst Rev(1): CD004740. Klemm E, Haroske G, Wollina U. Otitis externa and myringitis due to demodicidosis. Acta Dermatoven APA Vol 18, 2009, #2. Romsaithong S, Tomanakan K, Tangsawad W, Thanaviratananich S. Effectiveness of 3 per cent boric acid in 70 per cent alcohol versus 1 per cent clotrimazole solution in otomycosis patients: a randomised, controlled trial. .J Laryngol Otol. 2016 Sep;130(9):811-5. doi: 10.1017/S0022215116008598. Epub 2016 Aug 1. Rosenfeld, R. M., et al. (2014). "Clinical practice guideline: acute otitis externa executive summary." Otolaryngol Head Neck Surg 150(2): 161-168. Sander, R. (2001). "Otitis externa: a practical guide to treatment and prevention." Am Fam Physician 63(5): 927-36, 941-2.